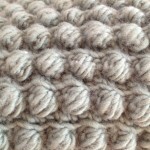 This took me a little while to crochet but I absolutely love the effect that popcorn stitch makes. 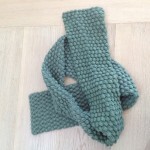 I used 4 skeins of mint Malabrigo worsted 100% merino yarn which I bought from one of my favourite London yarn shops, in Angel called Loop Knitting. 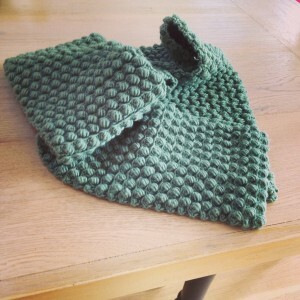 I have this scarf for sale in my etsy shop. 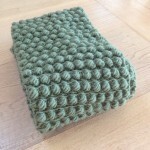 To do the crochet popcorn stitch (yarn over, insert hook in indicated stitch, yarn over and draw up a loop) 4 times, yarn over and draw through all loops on hook. I used a 5mm crochet hook. Row 3: Ch 1, turn, sc in each stitch across. Row 4: Ch 1, turn, *sc in next 2 sc, popcorn in next sc; rep from * to last sc, sc in last sc. Rep Rows 2-5 until Scarf measures 50 in. (127 cm) from beginning, end with Row 3 or Row 5. Fasten off and weave in ends.